How do I select my meals after I choose a meal package? Once you add meal package to cart, you can continue shopping and go directly into meal option categories and select desired meals. Why do some of the meals have a zero dollar amount under them and others have a dollar amount? The meals with a 0 dollar amount are included in the base price of the meal package. The meals with a dollar amount under them are an additional up charge per meal to the base package price. When will I know when my meals are coming? What if I am not home during my delivery time window? The food can hold temperature for 5 to 6 hours outside if someone was not able to accept delivery. Payment arrangements can be made directly with the driver. What meals are good for weight loss? All of the meals are healthy for weight loss, however eating 21 muffins will not allow you to reach your weight loss goals so please choose wisely. HMD suggests that men and women eat 4 meals a day. 1 meal every four hours with no snacking in between. Women should eat 2 full meals and 2 half meals each day. Men should eat 4 full meals per day. When is my order due? What happens if I place my order late? Orders can be placed anytime online from Friday to Monday. Orders are due Mondays by midnight. If you place an order after that time your delivery could be pushed to the following week for delivery. 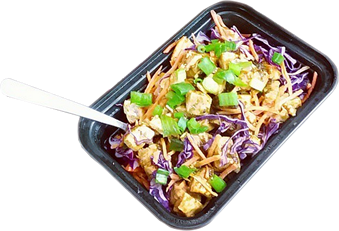 Grab & Go meals are available at both locations if you forgot to place your order on time. Please see our How It Works page prior to calling customer service. Why can’t I get my order delivered sooner than Sunday? HMD prepares orders Tuesdays through Saturdays to prepare for Sunday Delivery. Your payment will be processed the day your order is placed. If you choose a multiple week frequency for your delivery option ALL weeks will be charged on the day order is placed. What if I used to order a specific item but can no longer find it on the menu? HMD changes our menu frequently. If an item is not listed it is currently not available for order. You will receive an email confirmation immediately after placing your order. You can also login to your account and go to account history to see if the order was placed. Orders must be cancelled by Fridays at noon for full refund. If cancellation is past deadline customer is responsible for full payment. Can I modify a meal that I see on the menu? No, all standard HMD meals cannot be modified or tailored in any way. What area's do we deliver to? What time can I pick up my order and where? Click on the contact tab up above for information on all of our stores. Can I purchase single meals or only packages? HMD offers Grab & Go meals for individual purchase at either locations. All orders placed through the website are for packages only. I created an account but cannot log in, why? When you registered for an account HMD sent you a welcome email with a verification link in it. If you did not verify that link, your account will not be active and you will not be able to log in until you activate it. What is the sodium content of your meals? Our meals average 500-1000mg of sodium.